I know all this because I am one of those guys. I swear I can detect the glow of a Big Buck Hunter screen from a dive bar’s back room the minute I walk in the door. And, like many men who find the virtual sport irresistible, I’ve never hunted in real life — nor am I much of a gamer. Something primal just takes hold, and in the time it takes to burn through a few dollars, I barely touch my beer. When playing against other obsessives, I turn weirdly competitive, as if we’re all going to stuff and mount the heads of the bucks we take down — and I need to have the biggest. This is, to be clear, completely insane. 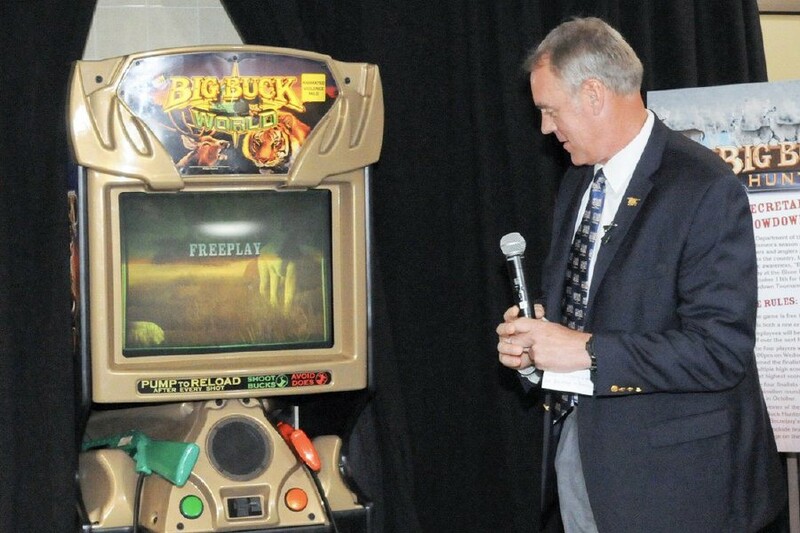 I think of all this when I see that U.S. Secretary of the Interior Ryan Zinke has installed the 2010 edition of the Big Buck franchise, Big Buck World, in the department’s employee cafeteria. Sure, we could roast him over not springing for the high-definition 2012 update, but that would be to overlook the PR score he’s aiming for: According to Sec. Zinke’s own office, the “temporary” placement of the machine “promotes hunting, fishing, and wildlife conservation,” as well as a “directive to expand hunting access on public lands.” The winner of a monthlong “Shotgun Showdown” will also get the grand prize of…“a personal visit with the Secretary.” Hot damn, bro time with the boss! Meanwhile, actual hunters are unlikely to be thrilled by an inaccessible arcade fixture that reduces their beloved pastime to a toy for drunk 20-somethings, particularly because Sec. Zinke, in the style of all Trump appointees, is currently engaged in destroying the thing he’s supposed to protect — the great outdoors. They feel betrayed by his attempts to roll back protections on the lands they want to keep rugged and pristine and, well, suitable for continued hunting. If mining and oil companies strip the American countryside, Big Buck Hunter may become a memento of a lost paradise. Is Big Buck Hunter sexist entertainment? That would be an oversell. But the cross-demographic appeal of its cartoonish version of masculinity — fawning showgirls and killer instinct and bragging rights on a Saturday night — are undoubtedly what put it in a government building. Sec. Zinke’s cynicism is in imagining that he’ll garner free friendly press and distract from the administration’s environmentally disastrous policy by looking like “one of the guys,” or, in Trump’s favored parlance, a “good guy.” Someone who, even if he screws up royally, is trying his best, just like you. The difference is, you play Big Buck Hunter with your friends for laughs, not at work for a photo op. The game is popular among city-dwelling hipsters in part for the irony factor — we play out a parody of the sportsman’s life we’ll never experience firsthand — meaning Sec. Zinke’s ploy feels all the more phony: He’s touting a video game as representative of a culture to which it bears the most superficial resemblance. Not exactly a bull’s-eye there, buddy.